Phil Marsh always wanted to run his own business. With a background in corporate sales he describes himself as ‘forever looking out for the next opportunity’. He established M&BG in 2011 by merging two companies, and then set about growing it by further acquisition. The company acquired contributed to M&BG’s growth from £1m turnover in 2011 to £3m in 2016. Profitability increased by 300%. 8 jobs were safeguarded and 9 more created. 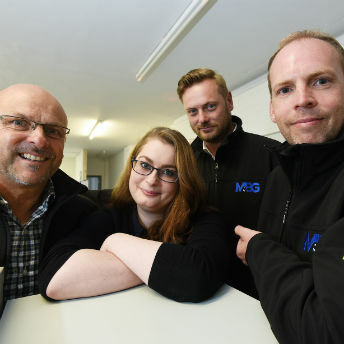 Phil believes that M&BG’s mentality is crucial to making the merger and acquisitions work – and his approach certainly seems to be successful. He understands the value of marketing and has always kept his focus on running the business rather than being ‘on the tools’. He is aiming for £10m turnover in the next 7-8 years – a target he feels is realistic, based on a sustainable pattern of annual growth.